While the U.S. media remain preoccupied with unsubstantiated sexual harassment allegations against Herman Cain, America is losing Nicaragua to the communists—again. The blatant stealing of the election in this Central American country has been ignored by headlines in the press proclaiming that Daniel Ortega won re-election in a landslide. The Obama Administration, which has encouraged the “Arab Spring” process that has resulted in Islamists making gains in the Middle East, has refused so far to condemn the theft of democracy in Nicaragua. Ortega, an accused sexual child abuser, and his communist comrades in the Sandinista movement took power in 1979 with the help of Democratic U.S. President Jimmy Carter, who said Americans had an inordinate fear of communism. Carter cut aid to the pro-American Somoza regime in Nicaragua and then proposed foreign aid for the Sandinistas. Carter also lost Iran to the fanatical Mullahs on the verge of acquiring nuclear weapons. In 1990 the Sandinistas were forced to cede power and hold free elections, which they lost, in the face of a military insurgency led by the Contras, Nicaraguan freedom fighters supported by Carter’s successor, Republican President Ronald Reagan. But Ortega and his backers never went away, subverting the democratic process through infiltration, fraud and theft. They have been aided and abetted by foreign aid from Hugo Chavez of Venezuela. This time, with no visible opposition from the Obama Administration, Ortega has stolen the presidential election in violation of the Nicaraguan constitution limiting a president to two terms. It is the Hugo Chavez method of seizing and maintaining power. Ortega’s cronies on the Nicaraguan Supreme Court violated the constitution and ruled that he could run for the presidency again. The paper forgot to note that Pastor worked for Jimmy Carter when the Sandinistas took power. He was U.S. national security advisor on Latin America and the Caribbean during that time. In recent years he has been promoting a “North American Community” that would merge the economies, and perhaps the social and political systems, of the U.S., Canada, and Mexico. An AP story in The Washington Post called Ortega the “one-time Sandinista revolutionary.” But there is no evidence that Ortega has ever stopped being a revolutionary. 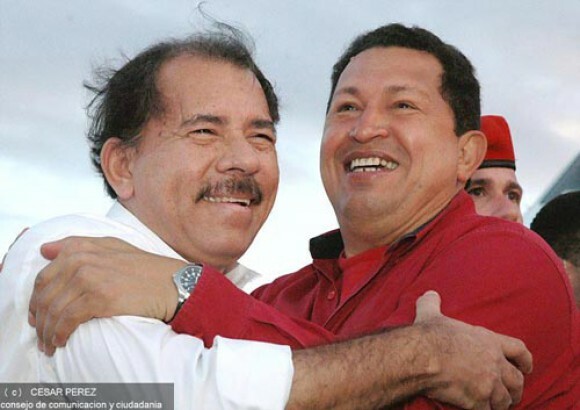 The website La Voz del Sandinismo highlights praise for Ortega from Hugo Chavez, Raul Castro and the Spanish Communist Party, among other Marxists and anti-American leftists. We had to go to a foreign news source, El País, a Spanish daily newspaper, to read about the cables disclosed by WikiLeaks which document Sandinista ties to drug traffickers. What actions is the Department of State undertaking to ensure that democracy and the rule of law are upheld in Nicaragua? Will the Department of State recognize the legality of the elections in November if Ortega is allowed to participate, in clear violation of the Nicaraguan Constitution? “The United States Embassy in Managua had no comment on Sunday’s vote,” The New York Times reported. On Monday, a State Department spokeswoman by the name of Victoria Nuland was quoted as questioning whether the elections were transparent and free of intimidation, violence and harassment. “There are quite a number of reports, and we’re concerned because the conditions weren’t good going in,” Nuland said. “And frankly, if the Nicaraguan government had nothing to hide, it should have allowed a broad complement of international monitors.” Nuland concluded, however, that the State Department would wait to make a “formal” comment. These brief and insufficient comments came at the end of Monday’s State Department press briefing. One of Ortega’s opponents in the election, Fabio Gadea, said the opposition will not accept the results presented by the Supreme Electoral Council because there are grounds for believing “a fraud of unprecedented proportions and arrangements” has occurred. The Ortega regime disqualified two opposition parties from the ballot. It sent police to ransack the offices of the country’s leading investigative journalist, Carlos Fernando Chamorro. Independent observers, foreign and local, were refused accreditation to monitor the election. But the Communists are happy with the results. Marxists and/or anti-American leftists are in control of the following countries in Latin America: Venezuela, Nicaragua, Ecuador, Bolivia, Argentina, Peru, Cuba, and Brazil. The Obama Administration seems perfectly fine with this, even to the extent of helping a Spanish-owned energy firm, Repsol, develop Cuban offshore oil drilling capabilities. Rep. Ros-Lehtinen was joined by U.S. Reps. Albio Sires (D-NJ), Mario Diaz-Balart (R-FL), and David Rivera (R-FL) in sending a bipartisan letter to President Obama protesting this help. Their letter says that Department of Interior assistance, guidance, and technical advice to Repsol violate the Trading with the Enemy Act. Under Obama, the State Department has also expanded travel and remittances to Cuba, despite an American hostage, Alan Gross, being held by the Castro regime.